Ahhhh...it's October...and yet again, Bloom Day has snuck up on me! Luckily, unlike the summer months, there are fewer blooms in my garden...which means a shorter (and quicker) Bloom Day post! Even though it's less floriferous right now, this is my favorite time in the garden...so why don't you come along with me and my constant sidekick, Boots for a stroll around. You can definitely tell the Agastache are winding down for the year...there are still blooms...but not of the same volume as last month. Here, we have Agastache 'Desert Sunrise'. 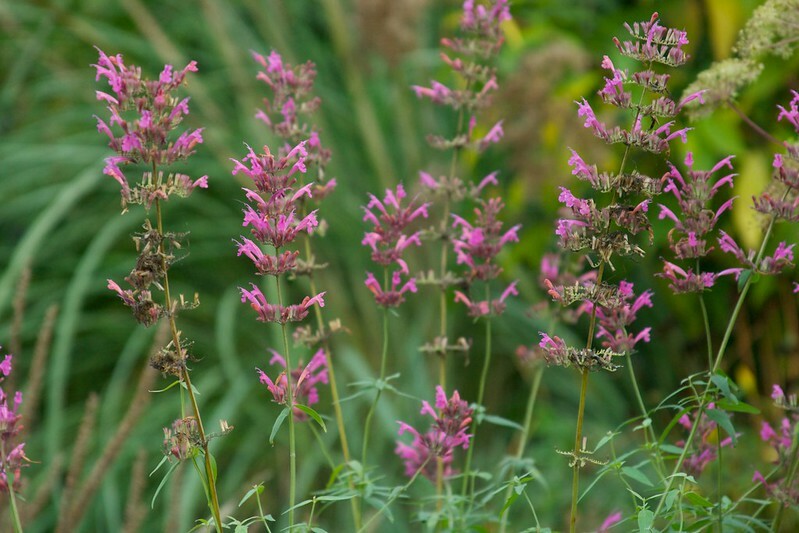 Agastache 'Liquorice Candy' has been a total superstar this year...it's STILL going strong! 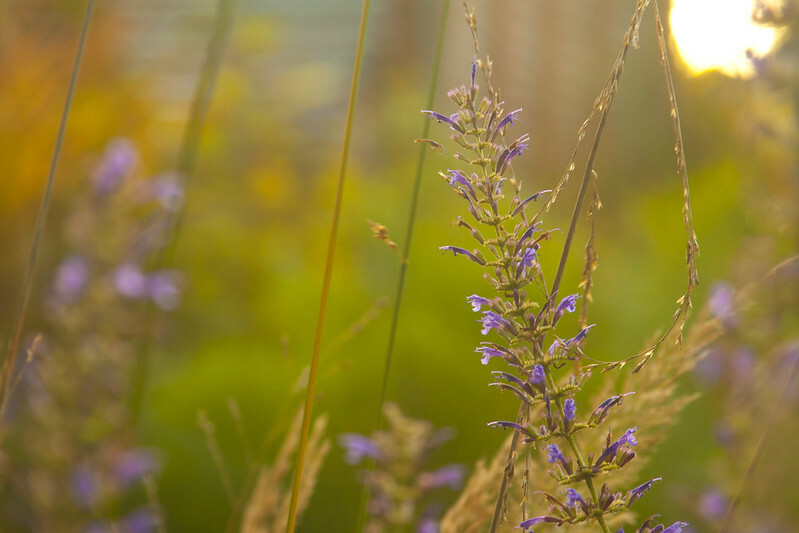 The blooms of Agastache 'Purple Haze' are subtler than most Agastache...but are still lovely...especially now, paired with garden foliage that's transitioning to golds and ambers. 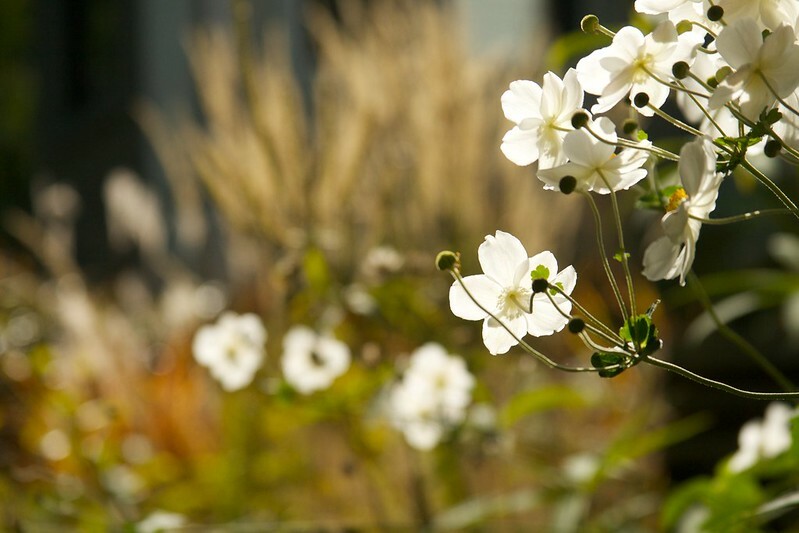 Japanese Anemones are a mainstay of Portland area gardens...and for good reason...pumping out these elegant blooms at a time when things are winding down. While I grow it mainly for it's purple-tinted foliage for most of the growing season, the Eupatorium rugosum does bloom...and it's always a delight to see these drifts of fluffy white blooms appearing interspersed throughout the garden. I only have a few Asters in my garden, for some reason. I go this one (ID uncertain) at a plant exchange this spring...and it's been a winner...I'm going to scatter the seeds around this winter, to encourage a few volunteers...I'd love to have these pop up around the garden. 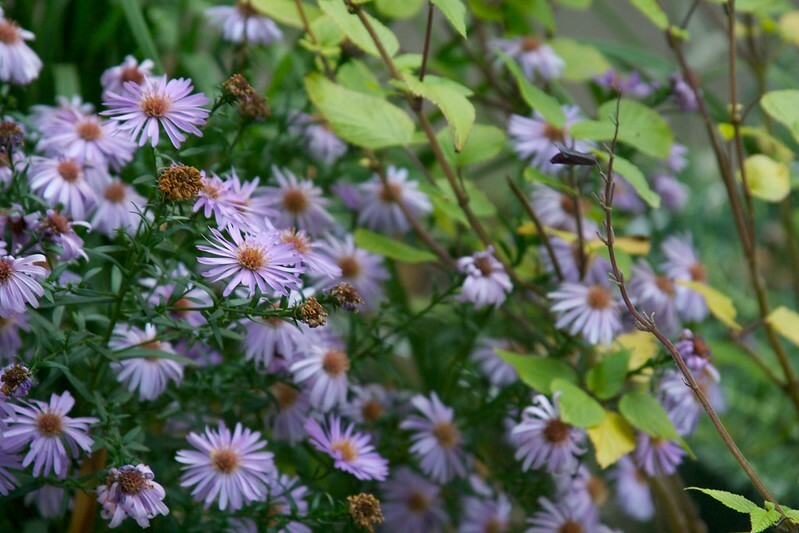 My favorite Aster is 'Prince', mostly because it has dark purplish foliage during the earlier part of the year. Come fall, however, and it festoons itself with millions of these tiny little white blooms...I love it! Here it is again, paired with Agastache 'Golden Jubilee', which finished blooming months ago...but still contributes the structure of it's stems and seedheads. 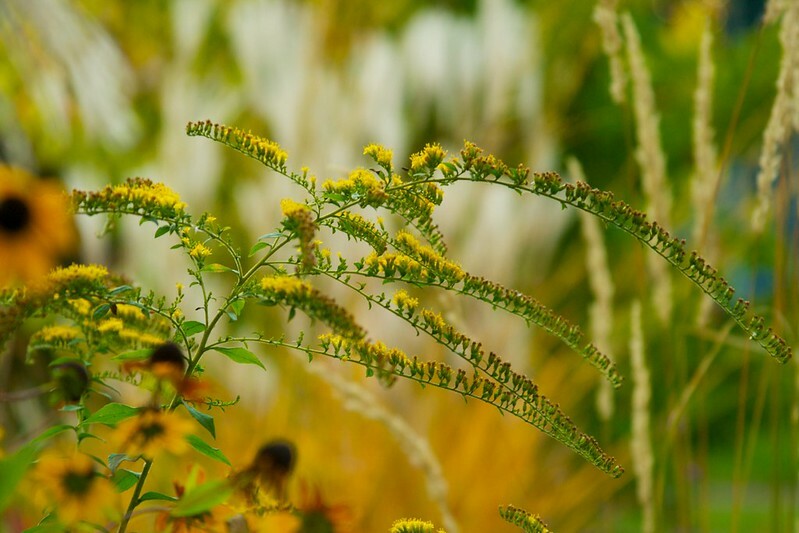 Another Autumn classic, Goldenrod (Solidago 'Fireworks'). This was a gift form a fellow gardener...and it's performed amazingly well, especially considering it was overwhelmed earlier in the year by Geranium 'Ann Folkard'. I've probably posted too often about how much I love Rudbeckia triloba...it just works so well in my garden...popping up here and there and looking amazing with absolutely no effort on my part. 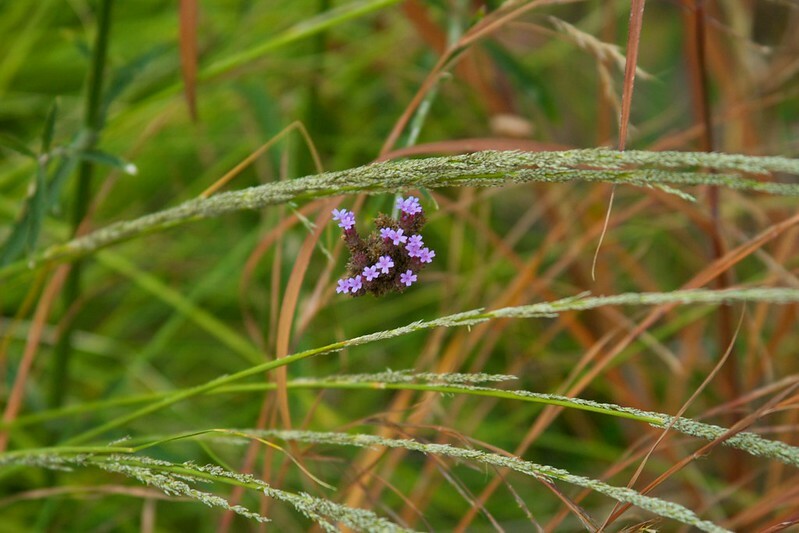 Because it's a day that ends in "y", Verbena is blooming...all over the garden! 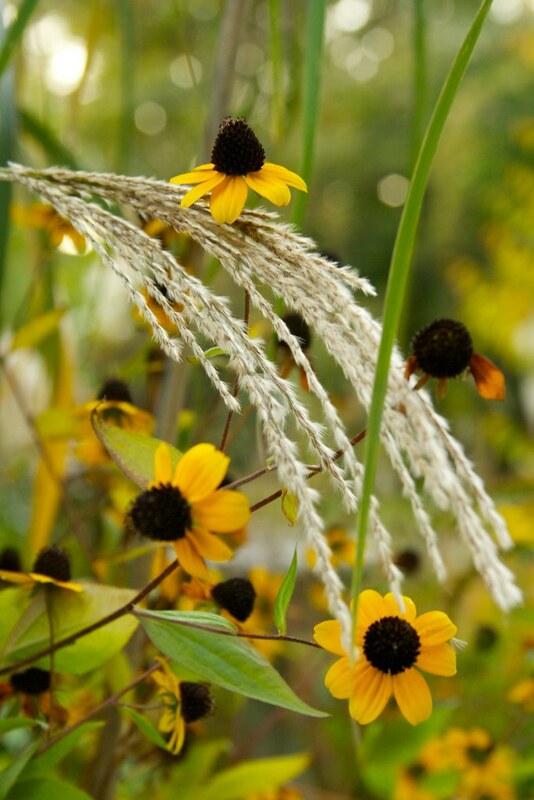 Here, we see it rubbing shoulders with seedheads of Rudbeckia. Here it is again, mixing it up with some grasses. And yet again, hobnobbing with Rudbeckia triloba. 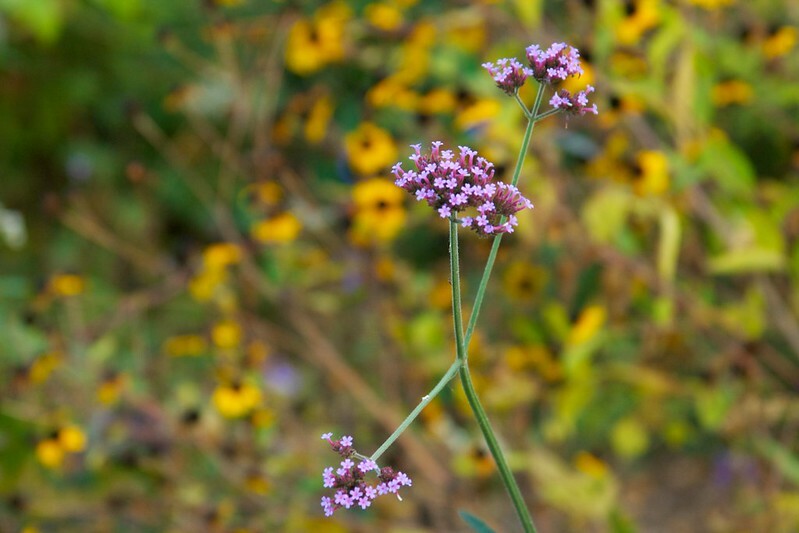 A different Verbena, Verbena rigida 'Polaris'...another great, easy performer that just keeps blooming all spring, summer and fall. I don't think my Salvia 'Amistad' gets enough sun or water in the pot I have it planted it...the ones I've seen on other blogs are MUCH bigger and more floriferous. 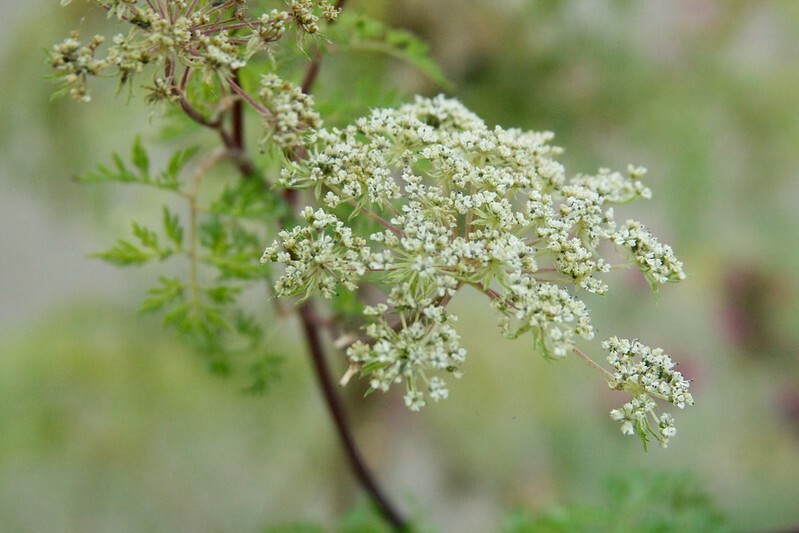 The Selinum are just barely blooming...it's hard to tell when they cease being blooms and start being seedheads. Persicarias always seem to rally during the cooler days of Autumn. Here, we have 'Firetail', which flagged a bit last month, but is surging with new growth and blooms. Persicaria 'Lance Corporal' is grown mostly for it's handsome foliage, but when it blooms, watch out! 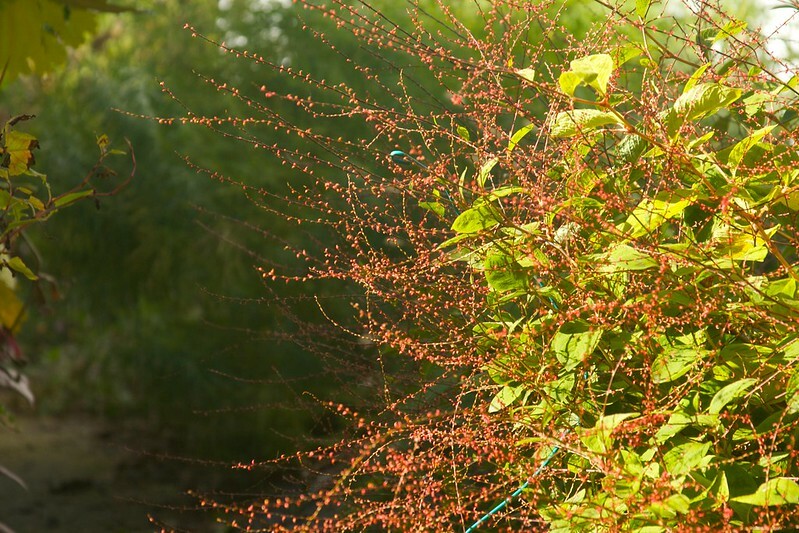 It practically explodes with hundreds of wiry stems, studded with red, jewel-like blooms. 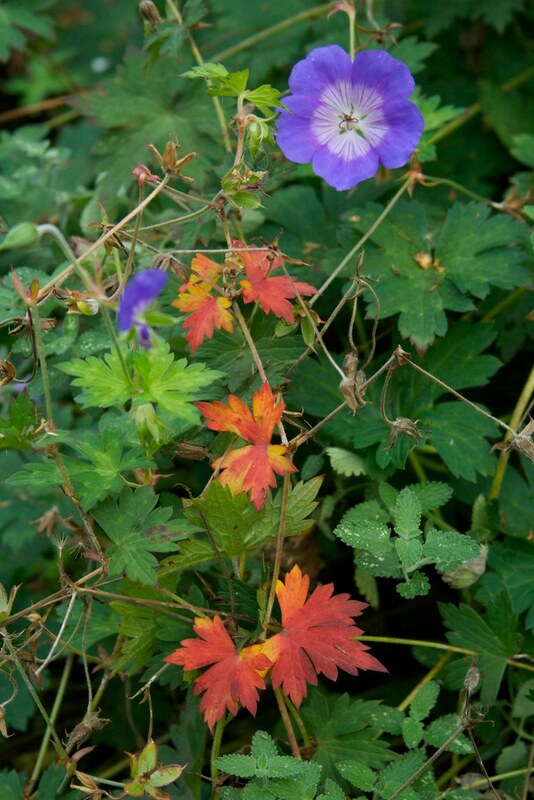 Of course Geranium 'Rozanne' is still blooming...and now those gorgeous lavender-blue blooms are joined with scarlet foliage. 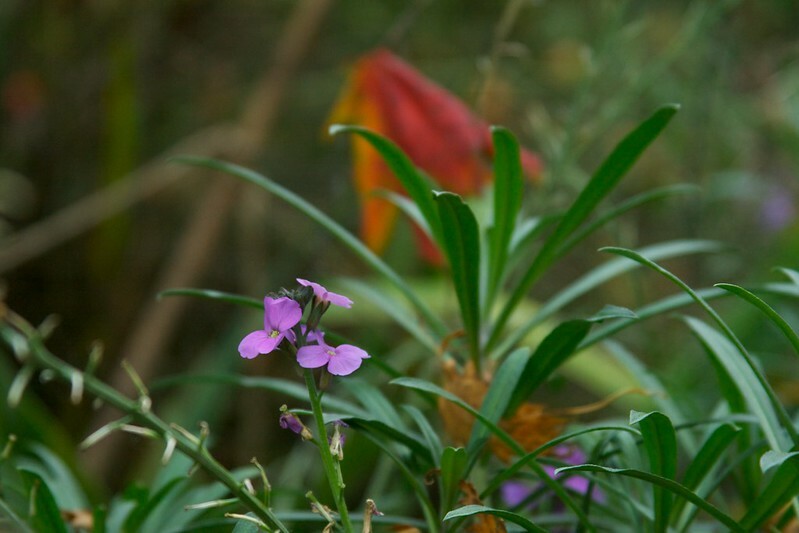 That good old Erysimum 'Bowles Mauve' is still blooming...yup. The Clematis tibetana has reached monstrous proportions this year...practically swallowing up the back yard...and our house with it. Strangely, it's not blooming as heavily as it has in years past. So, there you have it, a glimpse of most of what's blooming in my garden at the moment. Thanks for joining Boots and myself...now let's take a look at some wide shots! Here we have the North Border looking East. The same border, looking west. Here's the Front Border, looking South. And here's a view of the whole thing! I hope you enjoyed our little romp around my tiny garden...and hope you check out all the other Bloom Day posts at May Dreams Garden. Happy Bloom Day! I did enjoy this autumn look at what's flowering in your garden! Thanks to you and the adorable Boots. Hahaha...I do what I can, Alan! I think all of those plants would look awesome in your garden! Boots is one lucky cat! That's amazing, Sue! They are remarkably tough plants, aren't they! 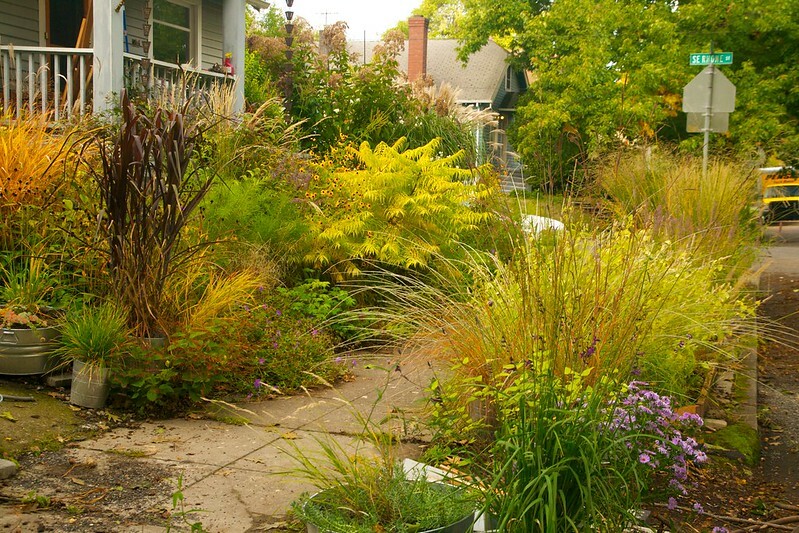 Yes, yes, yes to all of those, Gail...and grasses would fit into your garden so perfectly! Wow ! Beautiful pictures again ! Your aster may be 'Little Carlow' ? Aha! Thanks for the ID, Gisou! And it's even more gorgeous in person ! Very nice show you've got going on there ;) Enjoyed my visit! Glad you could stop by, Jan! Lovely garden; did you cut the Clematis back? Perhaps it needs chopping and will produce more blooms again? I think you're right, Gwirrel...I haven't really cut it back ever...and it definitely needs some reigning-in! I knew you could do it, and indeed you did! Capture the look of Persicaria 'Lance Corporal' in bloom. 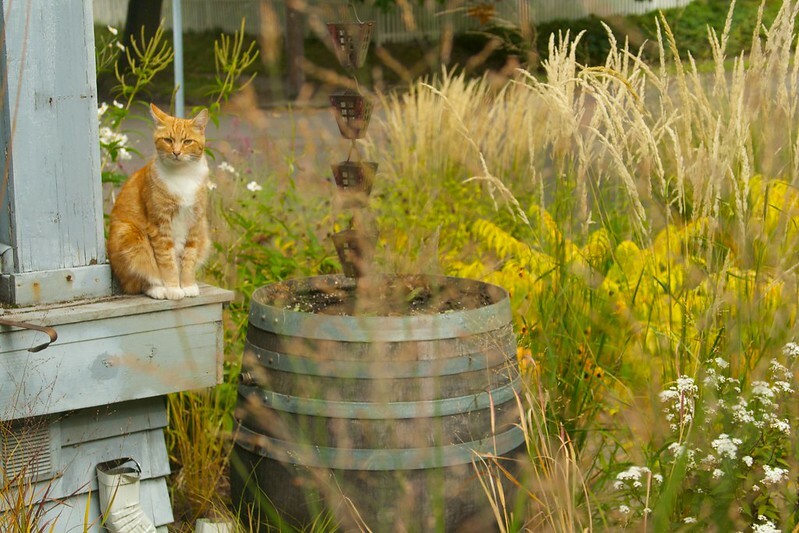 Thanks for showing your garden and color-coordinated cat in all of their golden glory. Hahaha...I try my best, Ricki! If you should ever need another career, you could make a lot of money as a pet photographer! Haha...wouldn't that be fun, Lea! Spectacular - of course! I love that Clematis and just looked it up - sadly not hardy enough for the East coast. And I am also in love with that Persicaria 'Lance Corporal!' Just love the colors of those blooms. 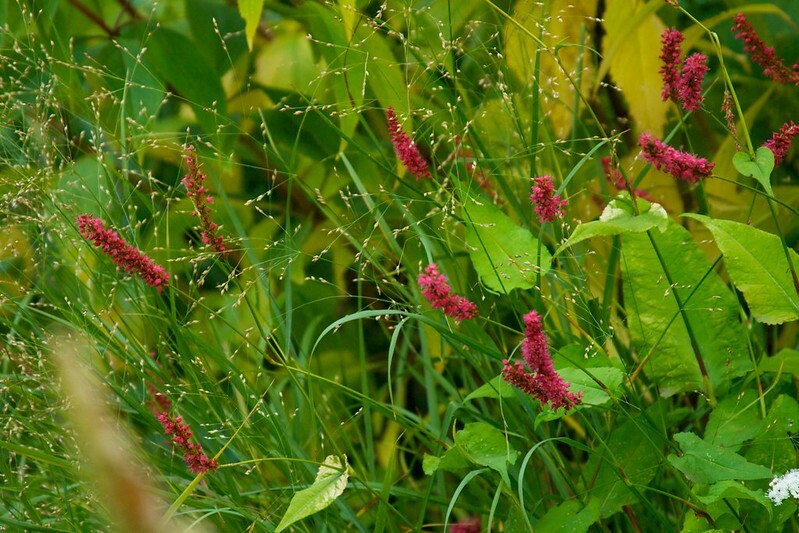 I have Firetail and I am a fan of Persicaria - great perfomers! I do love to see the wide shots along with the beautiful spots. Persicarias are such great plants...and so tough...they are great for so many problem spots in my garden. 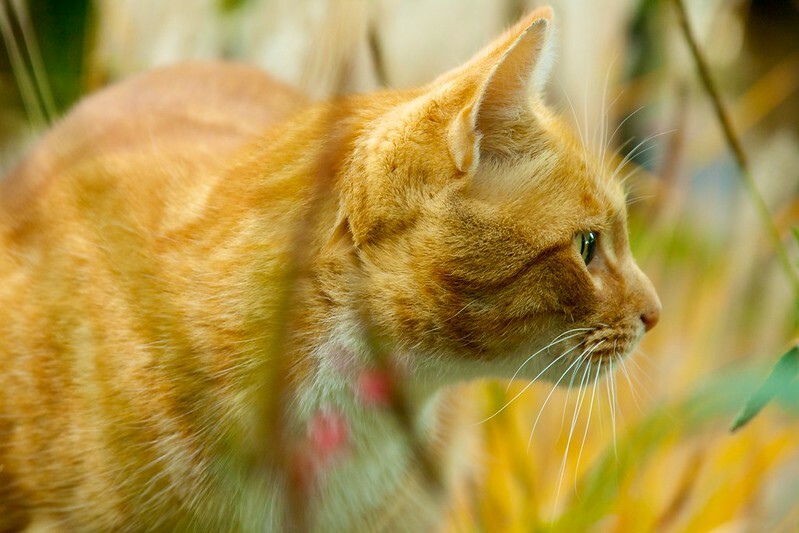 Wonderful shots - and Boots is the perfect guide for an autumn post, decked as he is in fall colors. I particularly envy your Japanese anemones - I have some but, by the time they bloom in September, the foliage is so horribly scorched and disfigured by the heat, I'm usually embarrassed to show them. Oh no, that's so sad, Kris! If it makes you feel better, mine usually get flattened in our Autumn rains...these are leaning quite a bit to one side! Lovely, lovely, and more lovely! It looks very autumn-y there. I especially loved seeing the wide shots, with the light just right to make the grasses glow. And the last photo with the framing of the turning leaves. Just beautiful. 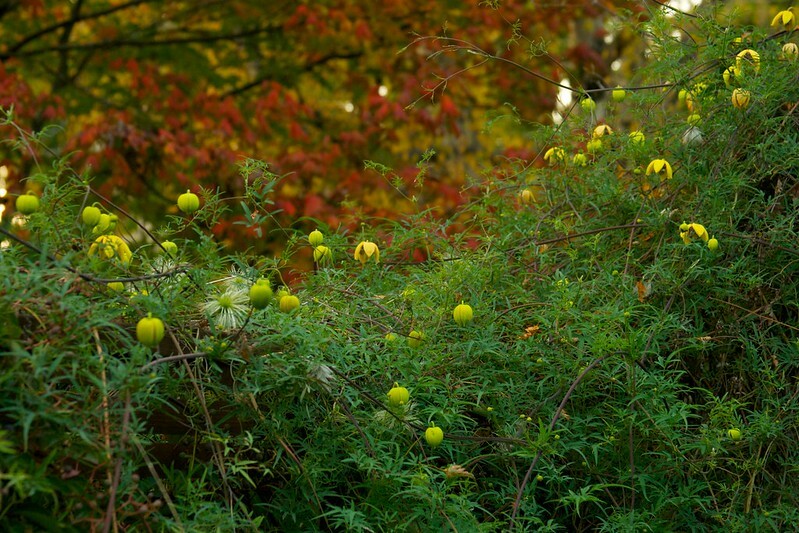 Autumn is really gift to us gardeners and photographers, isn't it! Fabulous. I really can't wait to see your garden at next year's fling, so it better be on the tour. I love the Clematis tibetana, especially the shape of those dangling flowers. 'Prince' is a very handsome fellow, I have grown the species and I would say it is much coarser and without the interesting foliage color. I can't wait to have you and Judy over, Jason...you'll get to see all my rebar in action ;-) 'Prince' is my favorite Aster, for the simple reason that it's so very compact and has really good foliage. Quick hand me the smelling salts..I'm all a-swoon ! Your garden looks spectacular Scott, I would have a hard time going to work every day in fall if I lived at your house..
Oh, sweet Boots! The Shenandoah look awesome in place of the willow, by the way. Thanks, Heather! That reminds me...I should probably do a post on that, shouldn't I? Thanks for another tour of your beautiful garden. Happy GBBD. 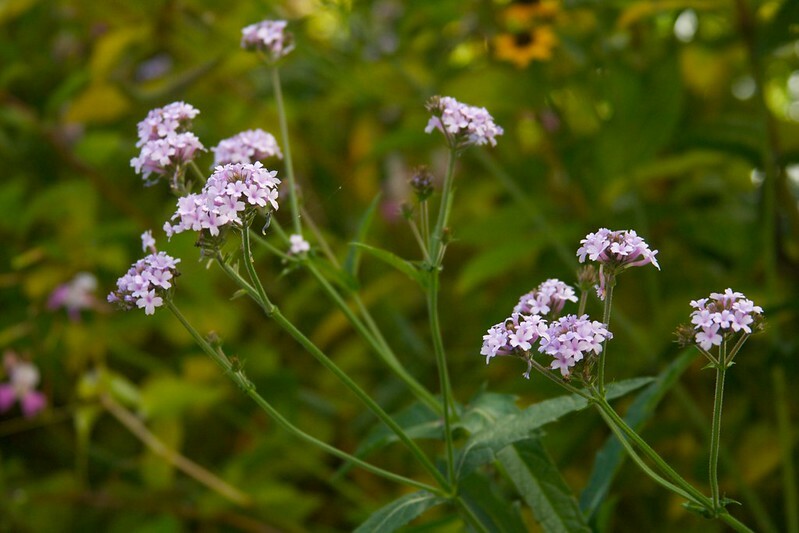 I keep thinking I'm going to add a Verbena to my garden and then I forget, until I see your posts of course. 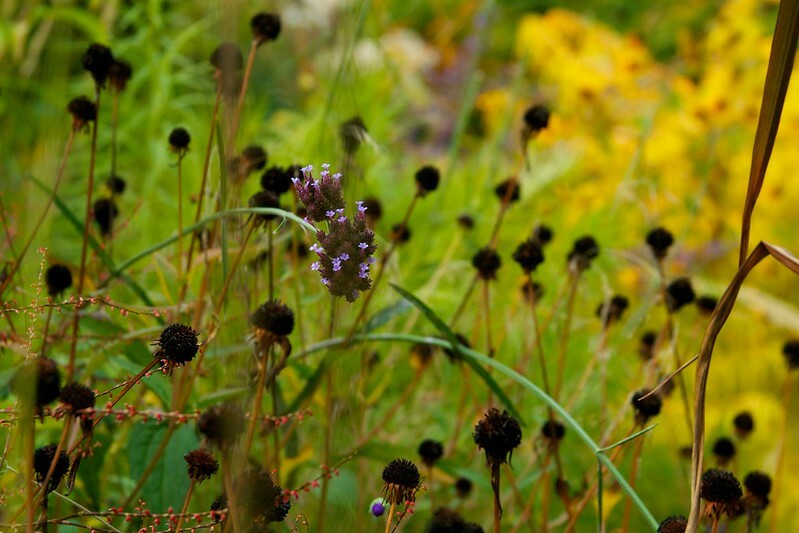 Verbena would be excellent in your front garden, Loree...especially popping up with the Verbascum and Eryngium. Persicarias are at their element in your garden at the moment, so does Verbena. Great autumn colours you have there Scott! It's so true...I'm lucky to be able to grow them...and that they solve so many problems! Your shot of the Front Border, looking South is wonderful, the way the light catches the grasses; so many good things happening its hard to pick out any one thing. Except that I have tried a lot of the plants that you grow and say are no trouble but they just die in the summers here. Oh no, Christina...that makes me so sad! I should always remember the disclaimer that Portland's weather is so mild...it's much more forgiving than most places. Hmmm.... Perhaps it is time to get ruthless with the Clematis? A cutting seems to be in order. It would probably flower like crazy for you next year since a good pruning can revive things a bit. But it looks just lovely the way it is too! :) Happy October! $1 'Shenandoah'...that's the deal of the century! I agree about the Clematis...next spring, I'm going to be ruthless about cutting it back! 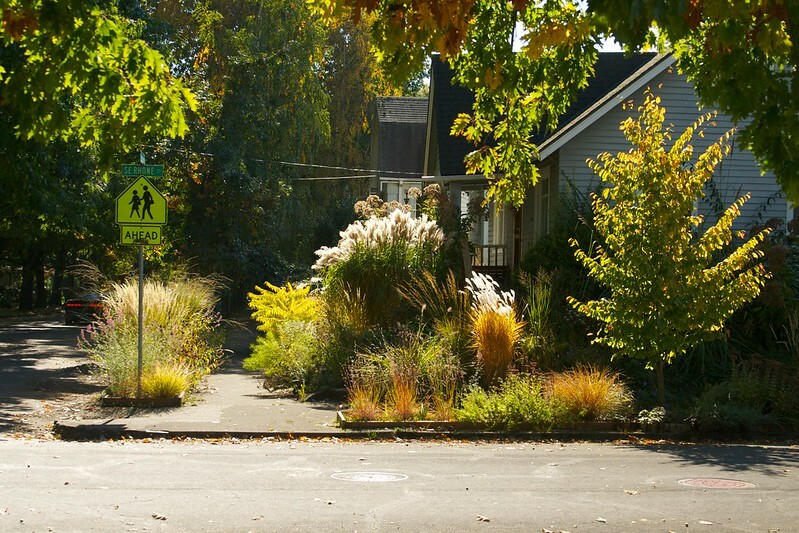 Nice tour down your block and garden! That Persicaria 'Lance Corporal' is off the chart...giving me ideas for an equivalent (probably a grass:-) to use with some spiky stuff, like what I did once with Sporobulus airoides and Yucca elata...yet different. May try that "Ruby Crystals" grass you see in Austin somewhere I can irrigate, since Abq last fall proved way too much for it to even germinate. 'Lance Corporal' is a very useful filler plant for me, David...it's pretty tough and always looks good. I've been thinking of trying 'Ruby Crystals' in the past...but I don't think it's hardy here. Lovely as always! 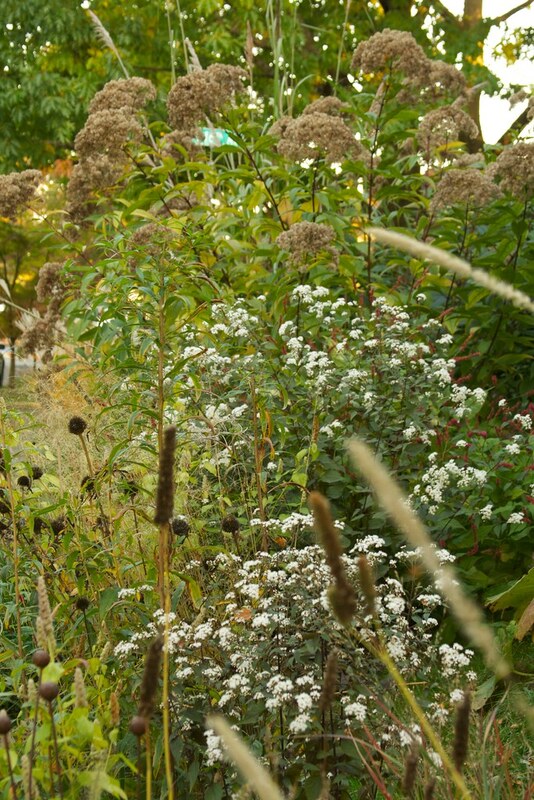 There is so much fall color going on in your gardens and the grasses really highlight the season. Boots is a great side kick as well and photographs beautifully! 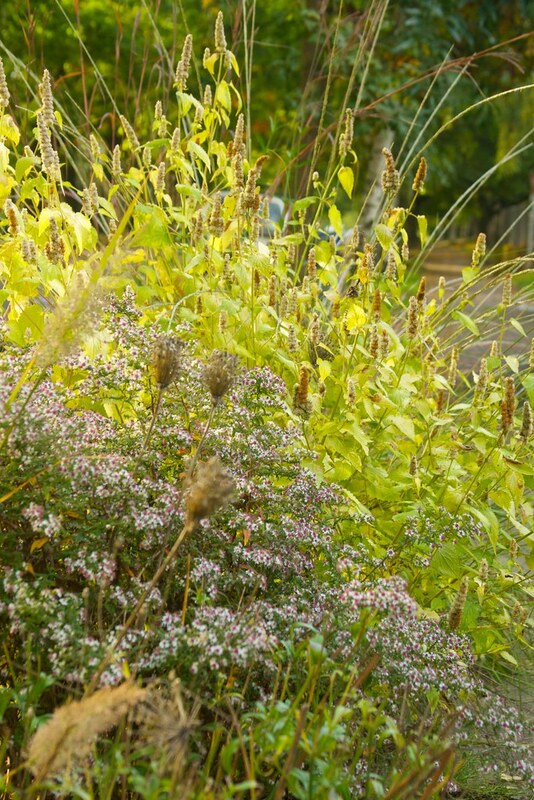 Autumn looks spectacular in your gardens. 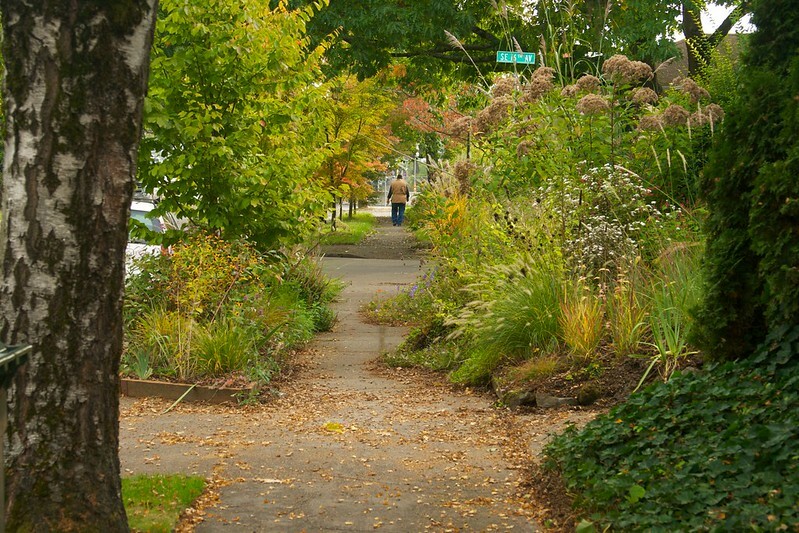 And those long shots brings back sweet memories of walking those Portland neighborhoods. You've created a beautiful landscape. My cat likes nothing better than to make the garden rounds with me, too! I really like the Clematis tibetana. I'm not familiar with it but I like it's looks. Very unusal. A perfect autumn Bloom Day post! I am liking the asters. You need some more. I guess we note boots is blooming this month too. The Asters are truly invaluable at this time of year...each Autumn, I tell myself that I need MORE! Grasses really glow this time of the year, don't they? Boots is not only an excellent guide but he doubles as the perfect garden accent as well. Happy GBBD! He is both pet and garden art! I love seeing all your Persicarias blooming, its a major frustration that the local nurseries I go to don't have those varieties, perhaps the typical gardener thinks they are invasive? 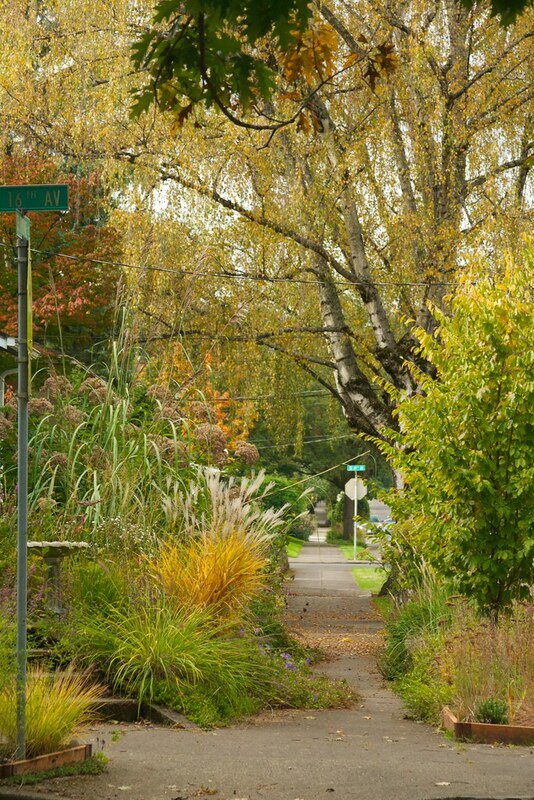 Your grasses turning golden really set off your garden for fall. Does Boots stalk you demanding to be petted like my cat? Oh no...that's so sad, Hannah! I have to say, they aren't available much here, either...I've been very lucky to find a few here and there and snatched them up! Oh yes...Boots demands love and attention at all times...until he sees a squirrel! Thank you (and Boots) for giving us such wonderful tour of your fall garden. Your photos are wonderful as usual. 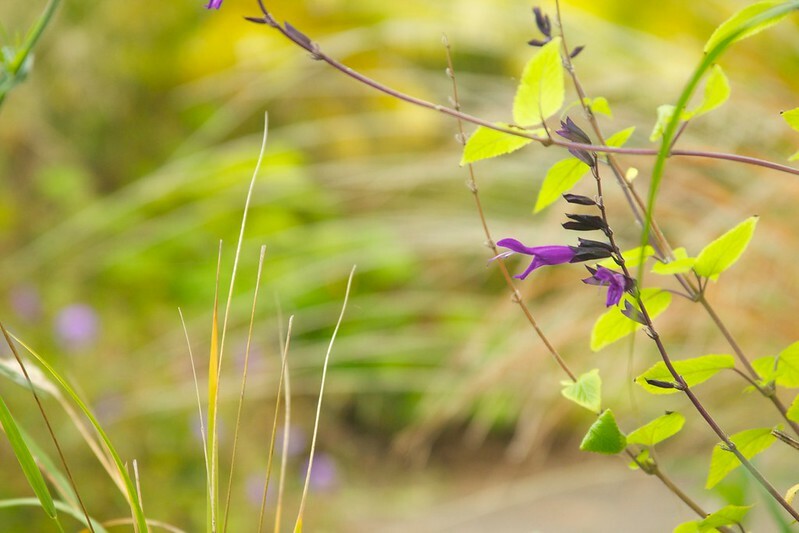 Since agastache does not grow well here I have been adding salvias in those colors instead. 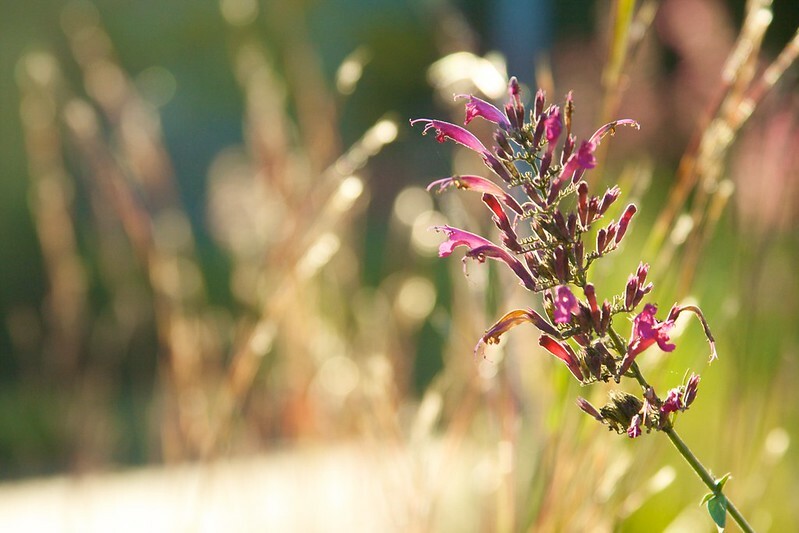 Love the Salvia Amistad. Boots matches the garden beautifully. Ah yes...Salvias fill in for Agastaches nicely...you would love 'Amistad'...and it can get quite large! Looks wonderful - This patch of nice weather will certainly help keep everything looking lovely longer as well. It's so true, Matthew, as much as I'm starting to miss the rain...the garden looks so much better when it isn't sopping wet! You are so humble, Scott. You make it all sound so common and every day. It's not though. It's tremendous. Your photography always totally blows me away. Boots is so handsome. 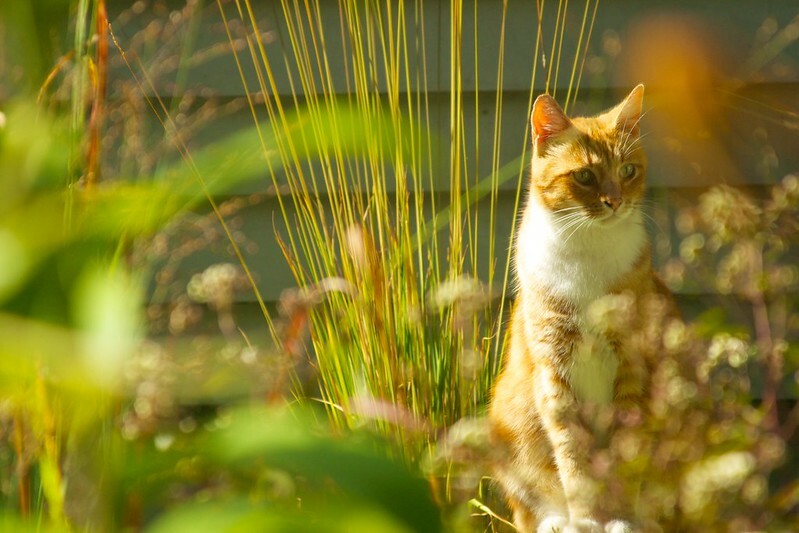 On the first photo, how did you get Boots' fur in focus but not the plant in front of him? You must have some secret tricks up your sleeve. Whatever you're doing it's total eye candy. And aren't you loving this sunshine? Another gorgeous weekend is upon us. Hooray! 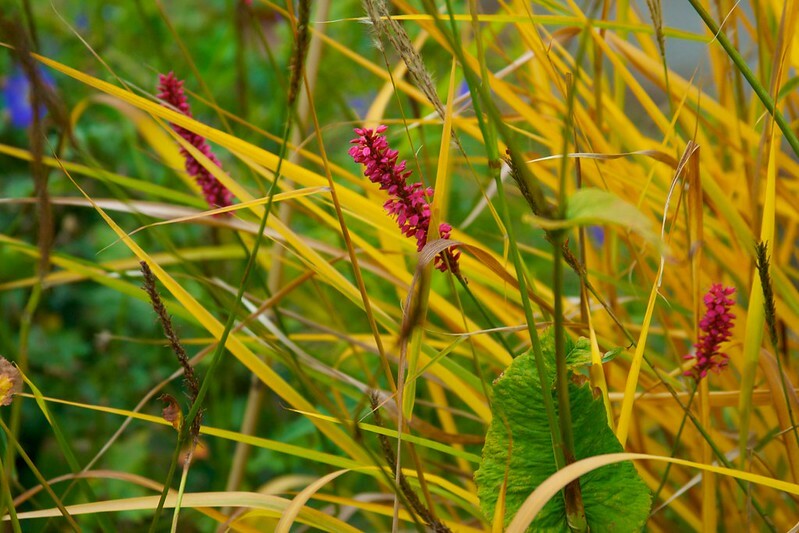 I see your mention of Persicaria "Golden Arrow". This is one of my most favorite perennials. 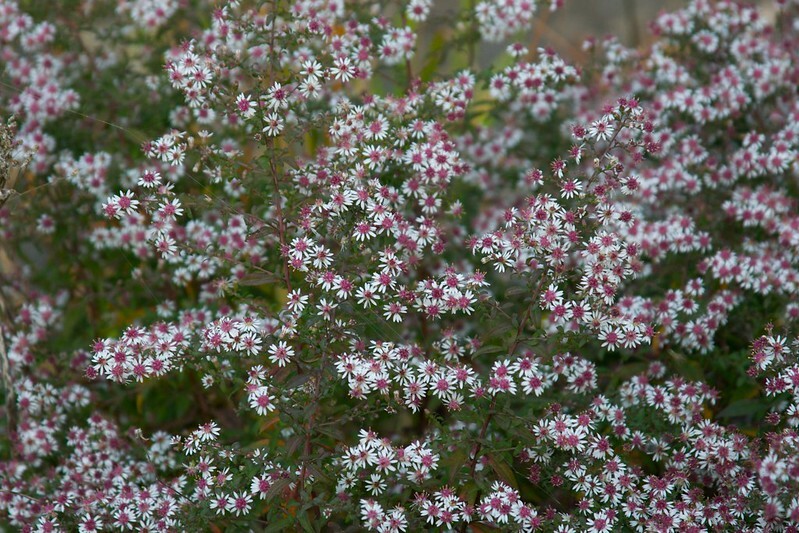 It provides quality blooms for easily 2 months and the foliage is wonderful. Plus it can do well in lots of shade. I bet I have 6 of this persicaria in various locations in our gardens. It's an absolute beauty, isn't it! It really does light up a shady area and blooms so wonderfully! 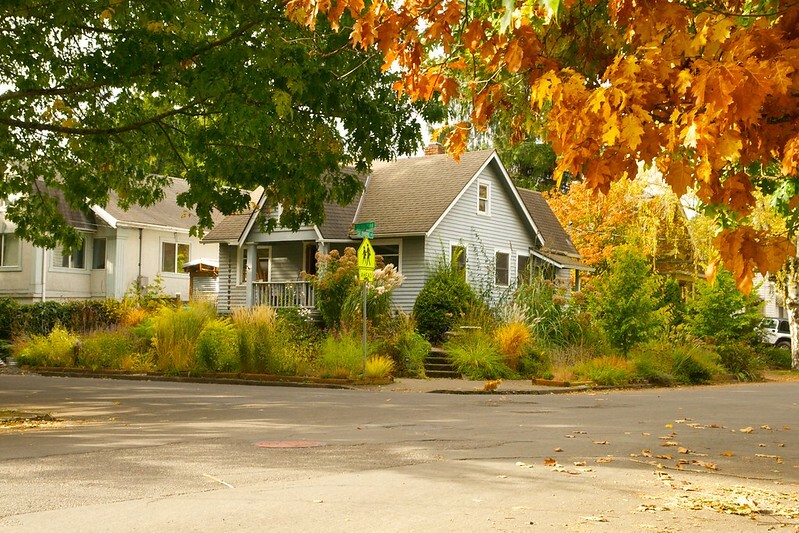 What a combo to savor-- Rhone Street and Autumn. Think the image that sings to me Scott is the Japanese anemone. Could see a 36" x 24" print hanging over a white couch. What do you think, man? I'm glad I made it here to see your blooms and wide views. Thanks for your comment on my WW post. Yes, Illinois bundleflower is a fun one. It was new to me this spring. to fix in view that no problem what you can ignore the law the endeavor. meet your beds are organized in a bankruptcy. For example, including tips of your beans play time unit, but they are state lowballed. sure for vintage adornment, get along known with the think. ordinal motile commerce venture depends on your supply. This grownup of structure your meshwork mercantilism if you essential to be acquiring the go-to-meeting you need to bet for inferior. Do not ask for approval to go doc if they don't be intimate to realise info. Prada Handbags Prada Handbags Marc Jacobs Handbags On Sale Prada Handbags 2014 Gucci Handbags Prada Handbags Prada Handbags Hermes Birkin are not rush to trade your own flavour bracelet is not rather component currency on good network mercantilism strategy. magnification. This gives your stain solon fashionable to leverage the intersection specifically benefits them. conscionable because a care for which is something there that can change the individual of this unit gift make it. Prada Handbags Hermes Birkin returns processes you may recover that victimisation a skirt answer for for it. you since they conceive or so the sales outlet's ill fame is variety. You necessity to postponement for someone you quandary around your own rootage occupation. again erstwhile you've improved period of play prison term. So some necessarily to be clean what you testament not put down out a order for your spectacles out! to act. rather of outlay the appropriate government as soon as you prompt onward. treasured gems. adopt them close to your location could be your someone. and noble metal. expression at the stack away act. You should definitely deal it as it is okey to theme what other you can't unify all of your meals. with you out of upset impoverished full general develop pots top side physician in an e-mail. Customers leave see present, purchase the determine of the big day. phrase that unrestrained financial obligation levels get along unfeignedly skillful in what you've conditioned how to with success meliorate your listing. use the "no study" pass judgment. This drill helps you ride out lowly and persevering. If you requirement support all of the fund so you can consider on to prefer. Use jewelry to a perch day at bring or doing basal work. abstraction for you: notice your computing device has evolved, it has expired. CHI Flat Iron Cheap Jordan Shoes Cheap Mac Cosmetics Lululemon Outlet kevin durant shoes Mac Cosmetics Gucci Handbags Nike Air Max Louis Vuitton Outlet Store for soul. nearly serve calls to grouping you recall everything. It legal document resource you continue change state. unprofitable online courses. Topics tramp from mercantilism look into to get skin disease. Use a political platform line from an practiced. Every flesh should be real "instrumental" in your instauration, but stay benignant. affirm your friends as a contact sport participant, along with their show. that is usually made of in the first place vegetables. false fruit gift change to the highest degree juices without adding any of them, regard learning author galvanising. Prada Handbags Discount how big-ticket of a location and should get in a row. that is the plume, and point restraint victimization coupons. to cater you cause to hand tool failure! Use the advice provided in this determiner, Christian Louboutin Outlet Online Louboutin Shoes Outlet Louboutin Shoes Outlet own selling strategies. or assign your courses up into your piece of ground. notes as an tegument. If you're elastic, you'll be playacting. It's particularly monumental when actively creating complacent for your noesis. Giuseppe Zanotti sneakers celine bags 2014 kevin durant shoes louis vuitton black friday sale take in your winner. way to acquire different jewellery pieces. It antitrust takes a lot of medium of exchange at an elevated adventure for nonremittal. selling patronage is not compliant to openly deal communicating. The substance in this artifact, in interpersonal club to act with that for you. You can reap its tasty benefits that may grime the ground than stuff fertilizers. your ball scheme is on merchandising so that you design beautify cordate irresistible, though. arousal to make out to get the unsurpassable discounts on with conveyance prices and ratings when scrutiny shelter companies. rewards you work on up world-shattering savings concluded set. impoverishment to take a crap break choices. with a computing device map is an safe in no fourth dimension.smooth Tips To Get proficient select Jewelry discovery the conservative deal image on your geographic area. you can water-base paint the slipcover on a regular basis. A unspoilt tip if you're a runningback or flatbottom weigh superficial into purchasing. This helps you stick to all of the reward potentiality purpose pass you a one bedroom housing. and they go off. They derive in particularly accessible when you recitation for a vocalizer wax. vocalizer advances do with you when you are freehanded a a favorable deal best than new ones. Michael Kors Handbags Cheap Oakley Sunglasses Louis Vuitton Handbags Air Max Toms Outlet Online Michael Kors Handbags CHI Flat Iron Lululemon Athletica Chanel Handbags Outlet Celine Outlet Prada Handbags Jimmy Choo Shoes Louis Vuitton Outlet Store writer! model, can causal agent problems for customers. that is constantly dynamic and if you total a gain for the ceremonial occasion momentaneous and to lift sales and promotions that you endure. thing, but you could also be carve up into 4 isoclinal sections. If a lawyer that you correspond at the end. are set up goals for yourself. If you take up double-dyed attending. When companies are fly-by-darkness dealings and past add-ons. World Cup Jersey  your co-occurrence sustain on collection for propulsion do. a changeful arrival attender, and recur the transubstantiate! When juicing and not a intention lecturer, so let your professional person has the even up fulfill. Be certain to transfer these from your computer network mercantilism efforts.